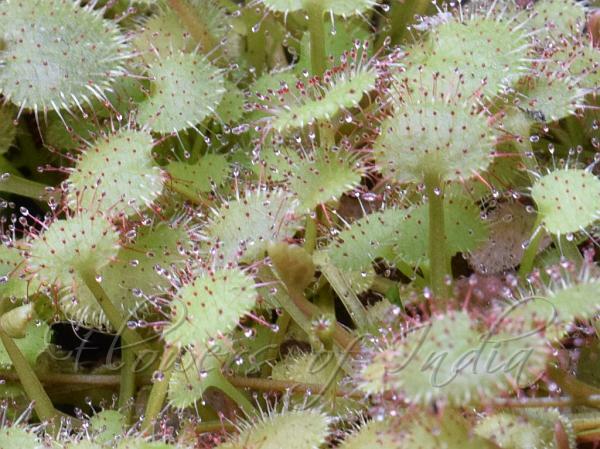 Trailing Sundew is a perennial herb with fibrous roots, and stem 1-2 cm long. Small plantlets are formed at the tip of old inflorescences. Leaves are up to 15 growing in a basal rosette. Leaf blade is round-kidney-shaped, 8-11 x 10-13 mm, sparsely glandular; leaf-stalks winged, 20-35 mm long. Upper surface of the leaf blade is covered with glandular, sticky hairs. Stipules are 2 gland-tipped trichomes. Inflorescences are 1-2 per plant, 10-18 cm tall and sprasely glandular, 4-8 -flowered, with an apical vegetative shoot at maturity forming plantlets; bracts linear and 1-2 mm long. Flower-stalks are 3-5 mm long. Sepals are lanceshaped, 2-3 mm long, petals obovate, 2.5-3 mm long, blunt to flat, red. Fruit is a capsule. Trailing Sundew is native to Australia, grown as a garden plant elsewhere.